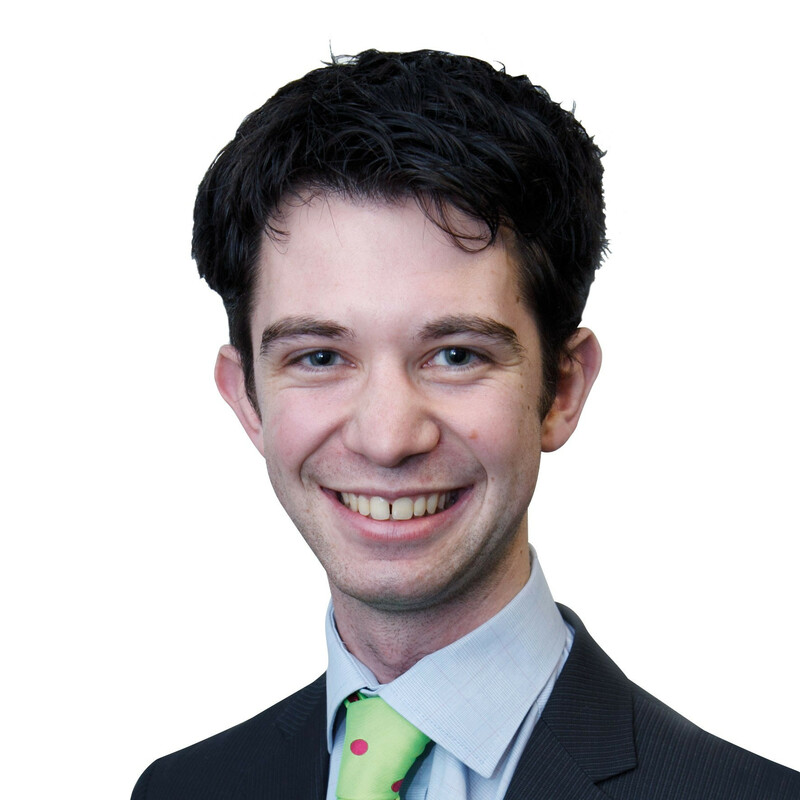 Nick Butler: Maglione hands Barelli lesson in sport politics - but will aquatics now suffer? In May last year, I flew into London and then, shaking off jetlag, went straight to cover a Presidential election which typified the brutal and secretive world of sports politics in all its glory. The election featured a challenger, The Netherlands' Erik van Heijningen, who had openly courted the media and extensively publicised his manifesto throughout the campaign. His incumbent opponent, on the other hand, did nothing of the sort. He ignored repeated attempts to do interviews and banned presentations by candidates during the vote, before using his Presidential address to shamelessly promote his campaign. He duly won in an election which saw all his opponents ruthlessly booted out of governing board positions. This was the vote for the head of the European continental swimming body and the winner in question was Italy’s Paolo Barelli. In many ways, it was remarkably similar to the way Uruguayan incumbent Julio Maglione beat his sole challenger in the battle for the International Swimming Federation (FINA) Presidency on Saturday (July 22). Barelli, recast in the role of reforming challenger rather than establishment pillar, found that the shoe was firmly on the other foot. On this occasion, it was he who was the victim of political maneuvering after being overwhelmingly dispatched by 258 votes to 77. But it is worth remembering that European election before bowing to the narrative that Barelli would have ushered in a new era of reform. In truth, a three-month campaigning period illustrated everything still wrong with sports politics today. Neither candidate did much in public to showcase their ideas. Barelli focused on an aggressively negative campaign in which he attempted to tear apart each of his rivals one by one. Maglione and his allies, meanwhile, largely stuck with old fashioned lobbying in “smoke filled rooms” and behind closed doors. There was more mudslinging than in an open water swimming race staged in a boggy lagoon. Barelli unsuccessfully took two of his opponents to the Court of Arbitration for Sport (CAS) while lashing out at others for whims ranging from governance standards to money distribution and anti-doping measures. The other side hit back by accusing Barelli of racism and exacerbating his links with Italian figures such as former Prime Minister Silvio Berlusconi. Barelli’s presence certainly made a process more interesting which would otherwise have been a coronation for one, 81-year-old, man. He did open much-needed debate on issues such as age limits and the distribution of funding. But, to be blunt, he ran a terrible political campaign. Like it or not, delegates from Africa and Asia make up a hefty slice of the FINA membership. His public claim that officials from the continent were “more interested in political and economic power” than anything else was therefore madness, however true some may consider it to be. This, as well as the two CAS cases, served only to unite factions who were not guaranteed to stand together. Any lingering discontent with the status quo was overridden in a case of “it is better the devil you know than the devil you don’t”. The Congress, which us media folks watched on a live television feed outside the room, began with a financial report. Barelli-backers from Iceland and Malta immediately took the opportunity to attack FINA’s funding model and, unimpressively, Maglione appeared visibly flustered and angry before gradually recomposing himself. A second dispute emerged soon after when a chorus of European delegates called for all candidates to have the opportunity to deliver a brief introductory speech. This seemed a reasonable proposal and was approved in principle by “independent” attorney François Carrard. But official after official from Africa, Asia and the Americas then stood up to oppose the idea. “They had three months to campaign, now it is time to vote,” said one. These “spontaneous” interjections seemed anything but and it was interesting how many of the speakers subsequently ended up being voted onto Commissions. It reminded me of the way the International Olympic Committee (IOC) requested loyal members to attack the World Anti-Doping Agency at last year’s Session in Rio de Janeiro. The motion was duly defeated and a convoluted three-stage voting process began to manually select Bureau members. You would think that a body with the ability to organise the timing of swimming races to 1000th of a second could pull-off out an electronic voting system, but clearly not. We had been told that the post-election press conference would take place at 2pm. But, after a hefty break for lunch, it was 2.30pm before the Presidential vote began. Barelli immediately charged to the front to demand an opportunity to present. This was rejected by former IOC director general Carrard who, while renowned as an intelligent and capable lawyer, seems to ply his trade these days as “independent” advisor for sporting bodies who only reaches conclusions sought by the leadership. At one stage, both Maglione and Barelli appeared to be calling for an opportunity to speak before being reminded about the earlier vote. This was certainly not the result of “transparency” in action, although it is worth remembering that no-one called publicly for such speeches until the day of the vote. Barelli, who banned such interventions in London last year, also helped draw up the agenda for the meeting in his former capacity as the now-defunct honorary secretary. Vote over, and landslide completed, there was more drama to follow at the closing press conferences. Maglione, for the second time in a matter of hours, was left visibly angry and shouting in Spanish in response to a question about why Russian President Vladimir Putin was awarded a FINA Order in 2014. Barelli and his European Swimming Federation colleagues then held a rival press conference in a neighbouring room where, in a much less hostile atmosphere, they repeated their claims about FINA being “infected” at the core. Interestingly, the Italian also suggested that Maglione was not the real power at FINA before implying that others are really pulling the strings. It was not clear who exactly he was speaking about. 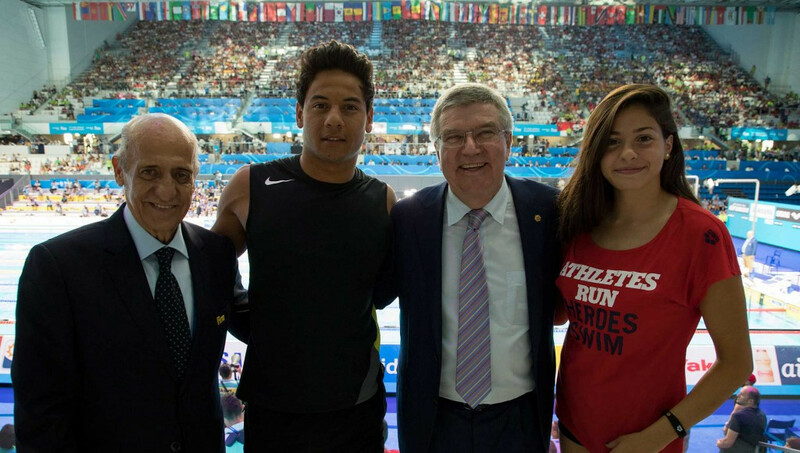 It could have been FINA executive director Cornel Marculescu, who has served in the role since 1986. It could have been re-elected first vice-president Husain Al-Musallam, who is currently denying a series of corruption investigations surrounding the Olympic Council of Asia (OCA). Or it could have even been OCA and Association of National Olympic Committees chief Sheikh Ahmad Al-Fahad Al-Sabah who, after disappearing from view in recent months, spent most of the week in Budapest and was working the room with his usual aplomb at a post-election Gala Dinner. There are two ways of looking at Maglione. On the one hand, there is no denying that he is an effective conduit with the Olympic Movement. As he repeatedly made clear in Budapest, he deserves some praise for successfully negotiating the introduction of three new medal events for the Tokyo Olympics. Like it or not, this ability to play politics is key in sport and the Uruguayan dentist does it with a surgical precision lacked by most. But he must also play to the aquatics world and, despite much lip service, there is not much evidence of genuine progress here. There appears to be a bigger gap between politicians and athletes, coaches and supporters than in any other sport I have covered. Even the additional men’s 800 and women’s 1,500 metres Olympic events have been criticised by stars including Australians Mack Horton and Cate Campbell for putting too much pressure on distance swimmers. The name change from synchronised to artistic swimming has attracted similar derision from sportspeople despite its near-unanimous approval during the Congress. Aquatics still gets a lot of things right. “All other sports could learn from the presentation at the World Championships,” one neutral observer told me. But there is a feeling that this is despite rather than because of the world governing body's leadership. 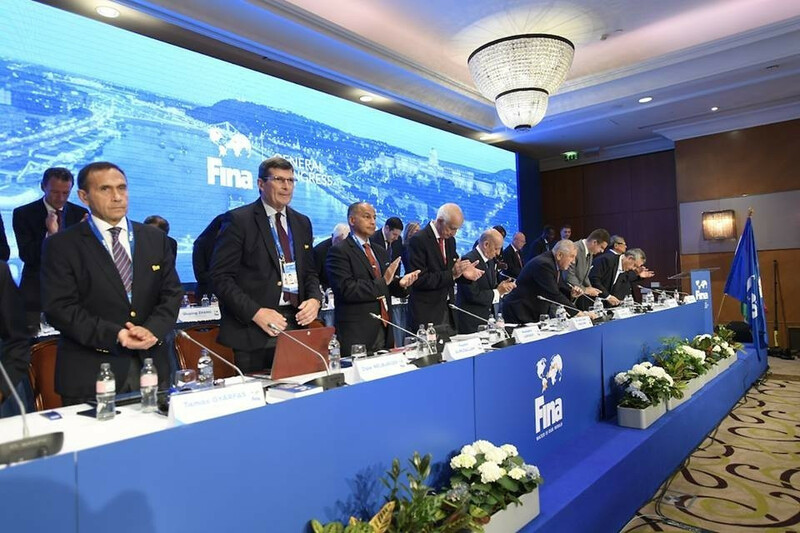 FINA must give athletes a more effective voice. They must increase the transparency of their decision-making processes and they must respond better to media enquiries. But, with the likes of Al-Musallam waiting in the wings to replace Maglione in four years time, there does not seem much prospect of genuine change. Unless, as was speculated by many at the Congress, we see a similar ground-breaking scandal to those experienced by FIFA and the International Association of Athletics Federations. Aquatics, like many sports, is at a crossroads. But expect more of a shift onto a sliproad than a genuine U-turn. It was striking in Budapest how interest in the 2024 Olympic race has declined since the IOC approved its joint awarding plans this month. There were no representatives from either Paris or Los Angeles at the FINA Gala despite a handful of voting IOC members being present. It shows how a lack of genuine bidding will massively decrease publicity for the Olympic Movement. Two days in the Hungarian capital, however, was enough to highlight what a brilliant host city Budapest could one day be. Its compactness would generate the perfect Olympic atmosphere and the city is a great mix of old and new. 2032, anyone?